It's a common problem, one that has probably happened to you, or you know someone it has happened to. I'm talking about broken or partially working headphone sockets. Unfortunately it seems to be a common problem with laptops (as far as common problems with laptops go). I'm not sure why, but I presume it's because the build quality of the headphone sockets is generally low. It happened to me not too long ago. Not because of wear and tear or because the headphone socket was of poor quality, but because of an accident. Admittedly it was probably partially my fault. I was visiting family and decided to bring my laptop and K701 along. Since the K701 use a 6.3mm plug, I had to use the chunky 6.3 to 3.5mm connector AKG supplied (which is a decent weight in itself). That alone didn't prove too much of a problem, though I'm sure prolonged use wouldn't do the socket too much good. The problem was that with the size of the plug and the adaptor, it was protruding from the laptop maybe a good 2 inches. It got snagged on some clothing, and you can figure out what happened next. Although I have a USB DAC, losing the headphone socket would have been a major inconvenience for me since the headphone socket also doubles as optical output (and I prefer optical over USB for the DAC, as I get some weird interference with USB). I also occasionally use the onboard audio with earbuds if I am watching something at night. I hadn't had the laptop too long when this happened, and I had no idea of what it's internals were like, so naturally I raged. My fear was that the headphone socket was built into the motherboard, as is the case for some laptops. Dell Inspirion Motherboard. 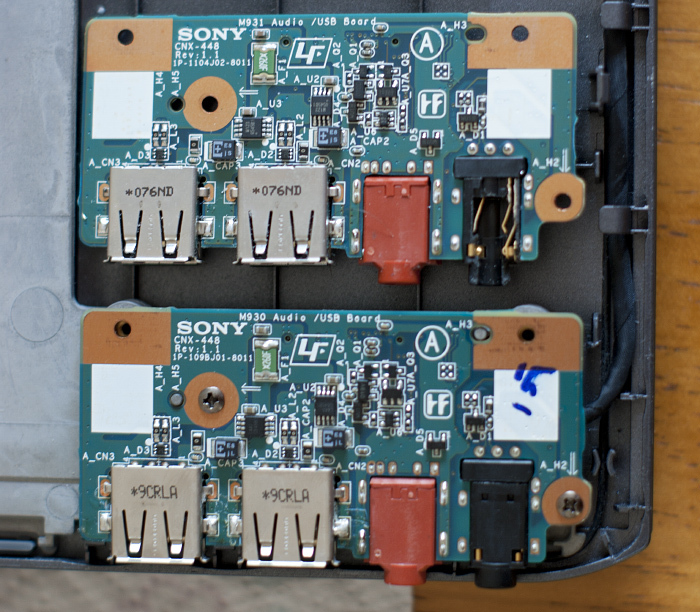 Note that the headphone and microphone jacks are built into the motherboard. This would require specialist soldering or a new motherboard. I can't remember exactly how it went from there, but I recall searching for service manuals (PDF files that Sony service center staff use for repair), browsing forums and looking for images of the motherboard, to try and determine if this was something I could fix myself. I got lucky. 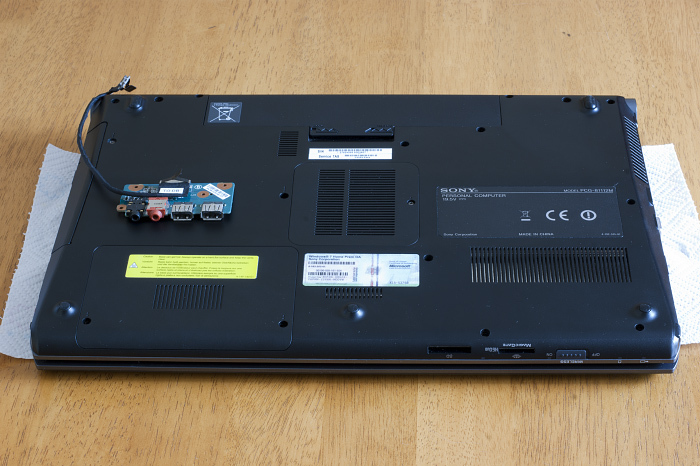 It turns out this laptop has the headphone/optical, microphone and USB ports on their own small PCB, meaning that as long as I could get into it, I should be able to swap the part out. 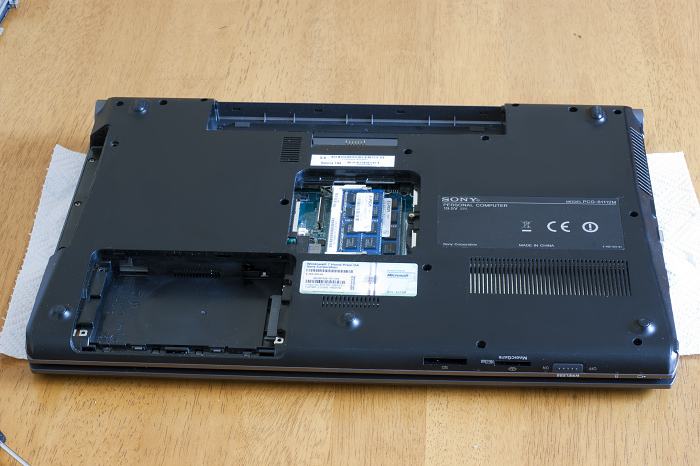 After a little googling, I managed to find out the part number, and was able to locate a replacement that was sourced from another laptop from The Laptop Centre. It's also worth checking ebay. 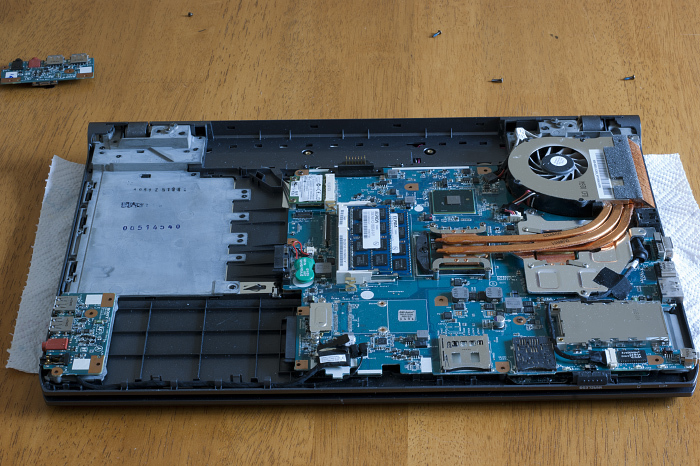 Replacing the audio board in this particular laptop was easy, and will take you 15 minutes or so. Make sure that you have earthed yourself and that you are not wearing any clothing that generates static electricity. A PZ0 Screwdriver. Must have a thin shaft to fit inside the recessed holes. A CNX 448 USB/audio board. The service manual or a laptop with this website for more detailed information . The service manual is for the Vaio VPCF1 series, which appears to cover the F11, F12 and F13. It contains exploded views and part numbers, so it's worth keeping just in case. The audio board in my F12 was a CNX 448 M931, but the replacement I am now using is a CNX 448 M930. Everything appears to work fine. Please refer to this website for detailed images on opening the laptop. It's fairly simple, so I shall just talk through the process. 1) An obvious step, but remove the power cable and disconnect the battery. I waited a few minutes with the battery out, and then held the power button in for about 10 seconds to drain any remaining power. 2) Now remove the DVD/Bluray drive. This is secured by two screws, one in the top left near the power button, and one to the left of the RAM cover. These have 3 small dots above the hole. 3) Proceed to remove the HDD. Looking at the HDD cover, there are two screws at the bottom, remove these. Again these have 2 small dots above the hole. Once you have removed those screws, gently slide the door toward you to reveal the HDD. Remove the two screws at the top securing the HDD and slide it left. Once it is free from the connector, lift it out. 4) Remove the RAM cover. The screw that secures the RAM cover does not actually come out as there is a retaining clip under it. What you have to do here is unscrew the door as best you can and then lift it up from the screw side (you should be able to slide a nail under it). 5) Remove the remaining screws from the back cover. I placed them on a table in the same position that I removed them from the laptop, but it would be better to draw a quick diagram to save confusion. 6) Now to remove the back cover. This was tricky at first as I wasn't sure what to expect. The bottom 1/3 of the cover felt as though it was still secured by something. I thought that maybe there were screws under the rubber pads but that wasn't the case. Joe Bleau suggests working from the HDD side and carefully sliding the cover. When I tried this it felt like it wasn't working (perhaps I was doing it wrong), so the method I used was to start from the opposite end and run my fingernail down the front of the case carefully forcing it apart, working from right to left. I stopped just as I got to the HDD bay and lifted the case at the right hand end a little which also seemed to lift some of the PCB with it. With the PCB clear of the lower half of the case, I was able to slide it right (as suggested) and get the back cover off. I suggest going with the original instruction of Joe's of , "Starting from the hard drive bay side, slide the cover, shake & bake with care & patience & remove the cover." Patience is definitely the key here. Fortunately getting the case back on is rather easy. 7) You will notice a lone PCB to the left where the HDD bay is. This is the USB/audio board. Remove the two screws securing it, and carefully turn it over and remove the cable. You will need to pull the metal tab toward you at the same time as pulling up on the plastic removal tab. This is the view as you remove the back cover. Notice how under normal usage, the motherboard is facing down, making it very easy to upgrade and service. 8) Replace the old audio board with the new one, and connect the cable. Secure it using the scews from earlier and then work backwards from step 6 to put everything back together. Power on and enjoy. That's about all there is to it. It goes without saying that the information posted here is a guide and you should proceed at your own caution. I'm not a technician or anything, just a regular end user, so if you are worried about anything going wrong, have it serviced properly. This kind of modification will probably void any warranties, so it's worth bearing that in mind (that doesn't bother me since I deal with stuff on my own). I want to say a big thanks to Joe Bleau at vaiofseries.com. Without his help and awesome guides, I probably would have ended up breaking something, so thank you. Hey, I just found this article and blog after looking for an M931 board for about a week. I have the same broken headphone jack issue but I am having trouble finding an M931 or M930 board. Although a long shot, I was just wondering if you might know of any websites that may have the board for sale. The Laptop Centre doesn't seem to stock the item anymore. Thanks for your help, and awesome blog. I intend to read the articles over the next few days as they're all really great and informative. Thanks for the kind comment. As long as it helps a few people, then I'm happy. Unfortunately, you will need to prepare for a long/frustrating search as is usually the case with laptop spares since they aren't readily available like usual components like HDDs, Optical drives etc. Try as many different search terms as you can. As you know, you can use the M930 or M931, so google something like "m930 audio board" or "m931 pcb" or any combination. 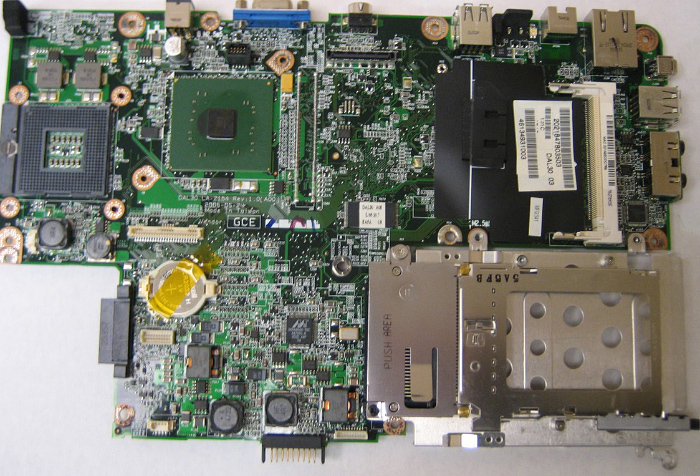 It also has a part number of CNX-448, or even try generic searches like Vaio F series audio board/USB board. I think I was extremely lucky when I found mine as I think I was in the right situation at the right time. The ebay link is for a whole motherboard, plus the audio board, so perhaps you could sell the motherboard. Then again, how many people go on ebay in order to buy a laptop motherboard? If you get really desperate, then you might even try wading through the various levels of Sony tech support to see if you can buy the part number, or maybe you could talk to some retailers (maybe the smaller ones) who stock Sony laptops, as they might be able to order spares through their channels. I have a bunch of stuff written up that just needs proof reading and tidying up that is yet to go live, so check back sometimes. Currently I have 2 headphone reviews already written, a third to write and I have a video I shot of how to properly open and clean the F series, including re-seating the CPU and GPU heatsink. Thanks for the reply. I've had quite an extensive search over the last week or so. The alternate search terms have been useful as well. I don't think i'll go to the length of buying a whole motherboard though haha. I'm sure i'll be able to find a solution soon, thanks a lot for your help. Looking forward to the new articles! I'm currently reading the Headphone buying guide and hope to try setting up my xbox wirelessly soon! Cool. There is one kind of workaround solution if you need headphone output but can't find a replacement audio board. It's what I did on my old laptop before. If you check some of my older posts, you will see me mention these things called DACs. In simple terms, they are like USB soundcards that typically have a headphone output. You can get all spec and sizes, but if you just want something equivalent to the laptop audio quality, or slightly better, there are portable DAC/amps by a company called Fiio. Converting an old router into a wireless adapter is a cool trick, but there are only certain models that can do it. You are basically limited by which devices support the custom firmware (or rather which devices are supported by the firmware as devs tend to add support for devices that seem to be good or popular). I did this so that I can plug anything in my router upstairs and it be linked wirelessly to the modem downstairs. If it's only the Xbox you want wireless, it will be less effort to get a wifi adapter from ebay. Part of the reason I did it is because I like to tinker with stuff and do things that are a little bit different. I've recently bought some arcade games/PCBs, so once I get all my tools and stuff together, there will probably be a few bits of info to be shared on those. Hacking up scart cables, putting resistors inline, splicing in power from a PC PSU and running the audio out cables to the Scart block was kind of fun, but the end result is messy. I think I need to get a PCB and do it properly next time. I've also discovered how amazing D-Sub connectors are. More than just connecting a wire from point A to point B, this will allow me to set up my arcade board in such a way that it has multiple outputs, which are modular and can be swapped out. For instance I can have the video of the arcade board going to a normal Scart TV, and another feed going to a component upscaler which then goes to a capture card for streaming tournaments. Then on occasion when my friend brings his arcade cabinets to events, it's just a case of swapping out the Scart cable to a cable which connects to an arcade monitor, or a VGA upscaling board to use PC monitors. Got a lot of cool information and ideas to share on this and people might take something away from this even if they aren't into games. The electronics side of things is pretty interesting and the possibilities has me wanting to make video circuits for everything. In one way or another, this is more providing solutions. Thanks for the info! nice information. You will need to check ebay. Search for M930 audio board on ebay. M931 will also work. M932 may work but the USB ports won't work as it's for a later revision motherboard. It might also help to search for MBX-215 which is the model number of the motherboard. Don't forget to try generic terms like VPCF12 or VPCF11 audio board/USB board. If any problem related to Apple Macbook . we provide best service for repairing. We are best Apple repairing service center in Hong Kong. We provide various tools for solving such problems. we will contact you and inform you about the recovery procedure. And we will provide mental peace to our customer by proper mailing and by tracking number.